"In an ideal world, people would write only when they had something important to say. Discovery or inspiration would be the driving force. In the real world, though, this is only one of several worthy motives. Academic authors do write for the pure joy of communicating ideas, but they also write for tenure, money, and fame." 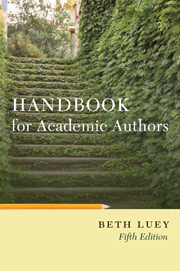 Whatever your motive for writing, Handbook for Academic Authors will help you achieve your goal. "Put this book into the hands of most of the young writers you know. It is neither pedantic nor patronizing. It will help them think better about writing and publishing. It could be read with profit by all academics." "Beth Luey has written the kind of basic text you might think has been around for years. Well it hasn’t been, and now it finally is. The text is sensible and fair to all parties involved in academic publishing. Her book is especially noteworthy for disabusing authors of unrealistic expectations, while recalling to scholarly publishers their obligations to their authors no less than to the bottom line." "...should be required reading for scholar/authors, or would-be authors...her book is a lucid and valuable primer that renders a needed service to academic authors and publishers alike." "Anyone from a graduate student to the still hyperkinetic producer (of textbooks or monographs or in between) can learn from this straightforward, sober, thorough, orderly, and practical guide, reinforced by classified, annotated, and evaluative bibliography." "This practical, informal and knowledgeable handbook is a fine guide to the highways and byways of academic publishing. It should be of considerable value to prospective authors."